GeIL has made some quite gorgeous modules with the GeIL Super Luce RGB modules. They perform well and can overclock either for higher speed or tighten the timings quite a bit. 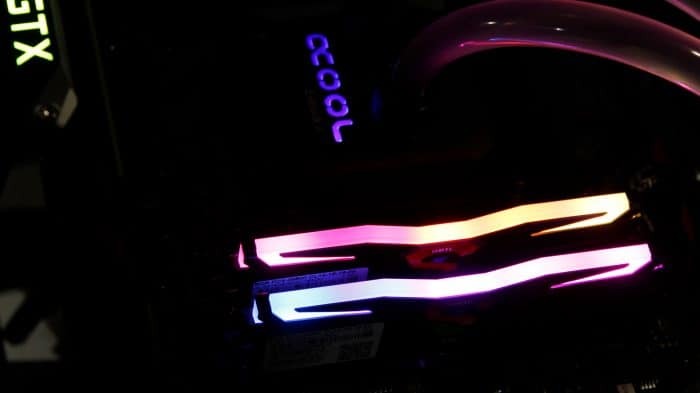 The RGB as you see below is well diffused and I would say its similar in appearance and smooth flow to the GSkill Trident Z RGB I have seen before. With the recent freefall of DRAM prices this kit may have fallen even more by the time you read this and let’s face it for the spec, you will be hard pressed to find much of a better value. The only detriment I could find was the less than stellar contact with the heatspreader due to thermal tape placement. But, as I said previously, it is really not that big of a deal as thermal density on DDR4 DRAM IC’s is minuscule and would cool itself better without a heatspreader at all. Value – 85 The Geil Super Luce RGB 3600MHz kit is the cheapest kit we could find on Newegg with 3600MHz spewed at CL16 with RGB. If you omit RGB there are a few options up to 15 dollars cheaper. With RGB however and the closest competitor is 15 dollars more from GSkill which also gives you a little better primary timings. so it does take a bit of a hit here. Performance – 90 The Performance is good and has headroom for tweaking so it scores well here. Innovation – 75 Innovation is a tough score on some components and GeIL simply has a B-Die powered kit that looks good and does what you expect. However they did not do anything revolutionary with a new design or function, so it scores well here but not chart-topping. Quality – 70 The quality of this kit is top notch if you only consider the PCB and components. But, when you have a heatspreader and its sole function for thermal transfer does not really contact the IC even if it doesn’t make a huge difference due to the thermal properties, it still has to be considered. I look at this kind of like turn signals on a BMW, even if people don’t use them it still needs to function properly, and if it doesn’t expect some blowback. GeIL made a kit that performs well with a tick of the XMP switch. 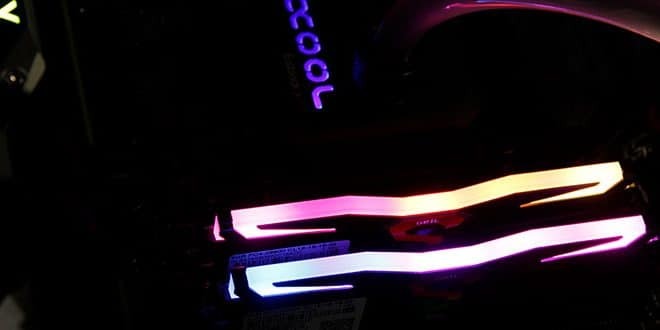 If you are willing to do a little light tuning the GeIL Super Luce RGB modules can really turn out some awesome performance with good looks to match!